We will no longer be posting direct links to the podcast here. Please subscribe to your favorite Podcast App. Thanks for listening!!!! Listen along to the crew at Campus Comics through a marvelous team-up (see what I did there!) 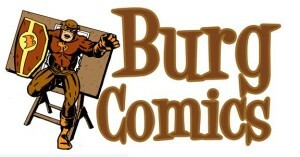 with Burg Comics to get recommendations on what to spend your hard-earned dollar on each month. For details on becoming a pull customer at Campus Comics, message Mike Noe on the Campus Comics Facebook page.